On the eve of the conventions, the portrayal in the news media of the character and records of the two presidential contenders in 2012 has been as negative as any campaign in recent times, and neither candidate has enjoyed an advantage over the other, according to a new study of mainstream media coverage of the race for president. More of what the public hears about candidates also now comes from the campaigns themselves and less from journalists acting as independent reporters or interpreters of who the candidates are. An examination of the dominant or master narratives in the press about the character and record of presidential contenders finds that 72% of this coverage has been negative for Barack Obama and 71% has been negative for Mitt Romney. The study, conducted by the Pew Research Center’s Project for Excellence in Journalism, examined the personal portrayal of the candidate in 50 major news outlets over a 10-week period. These numbers make this as negative a campaign as PEJ has seen since it began monitoring the master narratives about candidates in press coverage in presidential campaigns in 2000. Only one campaign has been comparable-2004 when coverage was filled with the controversy over the war in Iraq, the prison scandal at Abu Ghraib and the Swift Boat documentaries. That year, 70% of the personal narrative studied about Democrat John Kerry and 75% of that about incumbent George Bush was negative, numbers similar to now. Journalists themselves now play a smaller role in shaping these media narratives than they once did. Journalists are the source for about half as much of the statements about the candidates as was the case 12 years go. The campaigns, by contrast, have come to play an ever larger role in shaping these narratives. The candidates and their partisan allies are the source for nearly a third more of the personal narrative about the candidates than in 2000. On the eve of the nominating conventions, the discussion of President Obama in major mainstream news outlets is dominated by two narratives assessing his economic record-that his policies have failed to help the economy and that things would be much worse without his actions. Together these two narratives make up half of all the statements about Obama’s record and character-and the negative side of the argument outweighs the positive in the coverage by more than two to one. The next biggest personal narrative about Obama in the mainstream news media is one that raises doubts about whether the president really believes in American capitalism and ideas of individualism. On the Republican side, the No. 1 personal narrative about Romney is that his experience in private equity suggests he is a “vulture” capitalist who doesn’t care about workers, followed closely by the idea that he is an elitist out of touch with average Americans. The third-biggest personal narrative in the media about Romney is that he is a gaffe-prone, awkward campaigner. Only some of these narratives, however, seem to be sticking with voters-at least so far. While much of the press narrative has suggested Obama has the wrong approach to fixing the economy, voters are split on whether to associate that notion with Obama or Romney. They are also divided on which candidate believes in American values (though Obama’s ideals are questioned more often in the press). The two personal narrative themes that appear to be breaking through to voters are Romney’s elitism and his awkwardness on the stump. These are among the conclusions of a study that examined 1,772 assertions contained in more than 800 stories from major news outlets in radio, cable, network broadcast television, newspaper front pages and the most popular news websites in the country. The study of news coverage was twinned with a survey of public attitudes about the candidates by the Pew Research Center for the People & the Press. In all, five of the six most prevalent master narratives in the press about Obama’s character and biography were negative. And five of the six most prevalent themes about Romney were negative as well. It is hard to know whether the findings reflect the highly polarized atmosphere of politics in 2012, changes in the ideology of the two parties, changes in the culture of the news media, or some combination of all these phenomena enabling and reinforcing one another. One conclusion, however, is unavoidable: Journalists to an increasing degree are ceding control of what the public learns in elections to partisan voices. Less of what we are hearing is coming from the press as an independent intermediary, filtering or assessing political rhetoric. And to that degree, the press is acting more as an enabler or conduit and less as an autonomous reportorial source. Obama’s economic record dwarfs all other character issues in the campaign. Fully 36% of the master narrative themes about Obama in the press suggested that the president had failed to do enough to help the economy. That was more than twice the percentage of the counter argument-that the economy would be weaker had it not been for the administration’s actions-which made up 16% of the assertions about Obama. 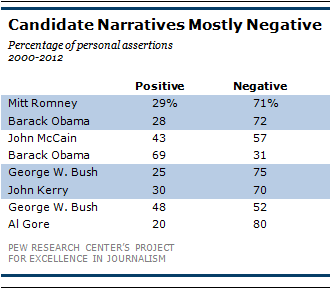 The media narrative about Romney is more diffuse, but includes a number of sizable negative themes-more than for Obama. The largest-that he is a callous “vulture” capitalist-made up 14% of the assertions about Romney. The idea that he was a rich elitist was almost as large (13%). The idea that he was a weak, gaffe-prone campaigner was also substantial (11%). So was the idea that his policies would hurt the economy (10%). Journalists are a shrinking source in shaping the candidate narratives, while campaigns and partisans have assumed a much larger role in defining the press discourse. Reporters (and talk show personalities) account for about half as many of the assertions about the candidates’ character and biography as they did 12 years ago-27% versus 50% in 2000. At the same time, campaigns, their surrogates and allies now account for nearly half of these themes, 48%, up from 37% in 2000. That shift, giving partisans a bigger role in shaping the media narrative, has been gradual and may reflect in part the shrinking reportorial resources in newsrooms. Campaigns have an even bigger voice in shaping the narrative online. On the 12 most prominent news websites in the country, campaigns and surrogates are behind 58% of statements studied about the record and character of the candidates-the highest of any medium. Outside experts have the smallest presence in the coverage online, making up just 2% of statements (versus 10% generally). The top political stories online tend to be breaking news, and this orientation may account for the larger role that partisans play here in shaping the narrative. Candidates and their allies put a premium on rapid response to ensure that their messaging is available in the early accounts of any news. What is not being projected in the coverage is also striking-namely the positive arguments that the candidates want to convey. Just 3% of assertions about Obama, for instance, contain the idea that he cares about regular Americans-which PEJ has found is a major theme in his advertising and his digital messaging. For Romney, in turn, there were more assertions refuting one of his central campaign themes-that he has the experience to fix the economy (10%)-than there were affirming the idea (8%). Voter perceptions vary from the media narrative. When we surveyed these personal themes with voters, the strongest impression was that 52% thought Obama was a person of good moral character-though it represented just 1% of the coverage about him and 10% of his coverage suggested the opposite. The theme about Romney that resonated most with voters was that he was prone to gaffes. Nearly half of voters, 47% associate him with that. In cable television, Fox and MSNBC’s coverage of the candidates’ character themes are mirror images of each other. Fox has offered a mixed view of Romney, but its assessments of Obama’s record and character have run negative by a ratio of six to one. The numbers are almost identical, in reverse, for MSNBC. Meanwhile, CNN has offered less about the campaign in general, but what is has, to a greater degree than its cable rivals, resembles what audiences would find in the rest of the media. In the four election cycles for which PEJ has conducted these studies, only two candidates have seen portrayals as negative as both Romney and Obama are seeing this year. One was Vice President Albert Gore Jr. in 2000. That year, fully 80% of the reporting of the major narrative themes about Gore portrayed negative messages about him. The largest was that he was tainted by the scandals of Bill Clinton and the second was that he was prone to lying. The other was George W. Bush in 2004, when 75% of the personal narrative studied was negative, led by the idea that he was arrogant followed by the idea that he lacked credibility. 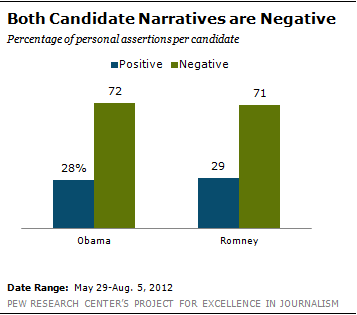 The negative portrayal of Obama and Romney in the press also finds some correlation in the way that the public views the candidates this year. Data from the Pew Research Center for the People & the Press and Gallup find that both of these candidates are viewed less favorably by the public-50% for Obama and 37% for Romney-than any Democratic or Republican nominees have been since 1992. Four years ago at this point, both Obama and the Republican candidate, Senator John McCain, had favorability ratings in the low 60s. The last candidate to have a favorability rating comparable to either candidate this year was George W. Bush in 2004, at 51%, numbers similar to Obama’s this year. The portrayal in the press about the candidates was also similar. What cannot be determined is cause and effect. To what extent is the media portrayal of the candidates helping make the public view of the candidates this year more negative? Or are negative public perceptions driving the press coverage? The study is not an analysis of media bias; rather, as it has for four campaign cycles, PEJ is examining what the public is hearing and reading from all sources in the mainstream media-from the campaigns, journalists, outside analysts and others. PEJ began to produce this series of studies analyzing the coverage of the candidates’ character and record to probe two major ideas about press coverage of presidential elections. One is that for all the reporting about tactics and strategy, campaign performance (the horse race), or even policy, in the end, character is central to how voters will choose. These studies are a way to isolate those messages about character and record and examine them in detail. The second purpose is to test the theory that the election reporting is heavily influenced by a handful of master narratives, or what some scholars have called “meta-narratives,” about the candidates. While every campaign is an ongoing story, the theory argues that journalists’ choice of facts and incidents is influenced by certain perceived character traits or themes about the candidates. And one concern about these master narratives is that they become self-perpetuating. Facts and anecdotes that illustrate ongoing storylines become magnified, critics worry, and events that do not fit with those running storylines get overlooked. Over the years these studies have tested the meta-narrative theory, explored how widespread certain narratives are about different candidates, how those themes have ebbed and flowed over the course of races, and examined the success of candidates in refuting negative assertions about themselves or projecting positive ones. In 2000, for instance, we found that the idea that George Bush was unintelligent was a major theme, though it had largely disappeared in 2004, replaced by the idea that he was arrogant. The idea that Al Gore was a liar stood out as a major theme in coverage in 2000, to the point that there were moments when the press misquoted him because they thought he had begun to exaggerate again. In 2008, the idea that John McCain was not a true conservative dominated coverage about him, whereas for Obama it was that he offered the promise of a new kind of politics, a theme that is now largely absent in 2012. To execute the studies, researchers draw up a list of character themes that they have seen in the coverage, creating an equal number of positive and negative themes. They then test a sample of stories to refine the list, add new themes and drop others, to identify which themes are indeed most common or obvious themes that campaigns are trying to project that are absent. Then a larger sample of reporting is examined to measure the presence of these themes across a broader swath of coverage.